Multiple myeloma is a type of cancer that is caused by plasma cells and often invades into multiple sites and tissues. In most cases, without biopsy ,a definite diagnosis also is obtained, while multiple myeloma’s diagnosis mainly depends on serum protein electrophoresis and laboratory biochemical tests. 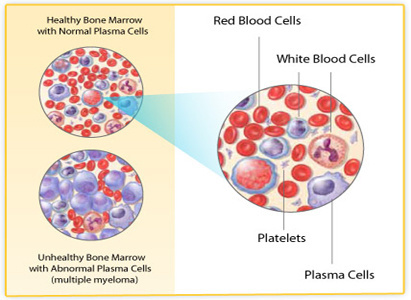 In some cases, when there is only single lesion, bone marrow aspiration to the no-diseased bone can identify whether multiple myeloma has been spread. Increase in serum abnormal globulin while normal or decrease in albumin, half urine Bence Jones protein shows positive. Anemia: The result of anemia test usually shows normocytic and normochromic with normal or low platelet. Bone x-rays can detect bone defects , bone rarefaction or pathologic fracture. Routine urine examination shows proteinuria, microscopic hematuria, but rare cylindruria, and plasma cells at sometimes. Renal function impaired , especially in the middle and late stage of multiple myeloma. Serum creatinine, urea nitrogen, creatinine clearance test, phenol red excretion test and radionucleiorenogram examination, which can determine whether renal function is impaired and the extent of damage. Experts of Modern Cancer Hospital Guangzhou advise that if you are diagnosed with multiple myeloma, you’d better go to a specialized cancer hospital to receive examination and treatment. specialized cancer hospital to receive examination and treatment.